Brief Description: Are you Shrewsbury Town Football Club’s biggest supporter? Never missed a game and know all there is to know about your favourite team? Then this quiz book is aimed at you. Containing 800 questions guaranteed to put you through your paces, the book will quickly discover if you are man of the match or up for relegation. With sections covering the players, managers, opponents, transfers, nationalities, wins, draws and losses that have shaped the club’s history, this book is packed with information that will educate and entertain in equal measure. Whether you want to catch out your mates in the pub or teach your children, this book is guaranteed to score a hit. 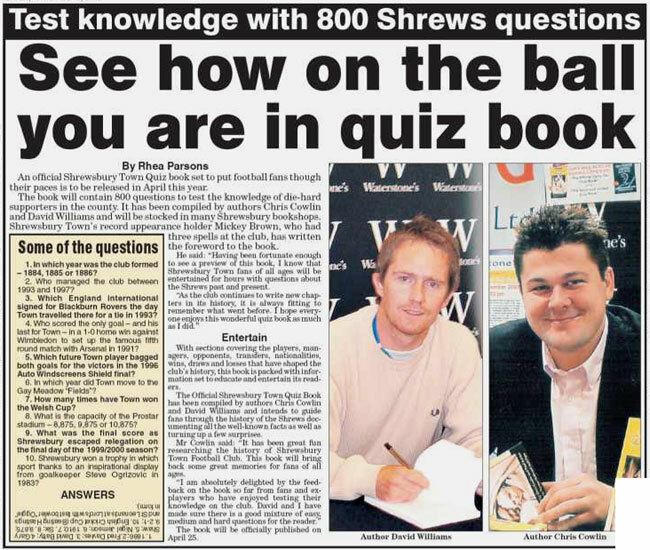 The Official Shrewsbury Town Quiz Book will guide you through the history of the Shrews documenting all the well known facts as well as turning up a few surprises. So, whether you are the Shrews number one fan or simply a dedicated football enthusiast, this tribute to Shrewsbury Town Football Club is simply a must have. David Williams: David Williams will never forget his first ever football match as an eight year-old watching Shrewsbury Town with his dad at Gay Meadow. Since then he has had a successful stint in local, national and international journalism, before carving out a career as a media relations and public relations professional that has worked in England and Dubai promoting their biggest sporting events as well as in Jordan where he works as an advisor to Prince Feisal Al Hussein, the brother of King Abdullah. 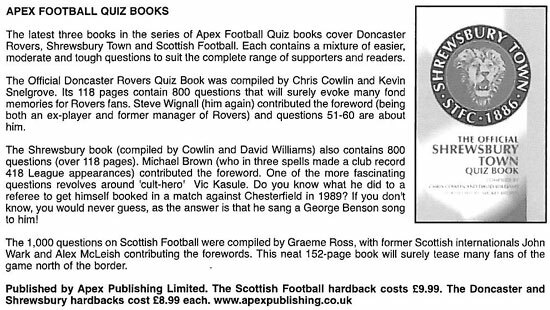 I am honoured to have been asked to write the foreword to ‘The Official Shrewsbury Town Quiz Book’ compiled by Chris Cowlin and David Williams. I had three spells at the club; I first arrived in the 1980s as an apprentice and break into the first team the year later. I played with some great players during my time at the club and played under various managers. I made a club record 418 League appearances, scoring 36 goals. It was a great moment in my career when the club were crowned Division Three Champions in 1993/1994 and when I helped to keep the club in the Football League by scoring against Exeter City in the 2-1 away win in May 2000. I played my last game for The Shrews in 2001 and joined Boston United, I can honesty say that I have had an enjoyable football career which has lasted over 20 years. I would advise you to remember these facts as they will help when you are answering the Mickey Brown section! The history of Shrewsbury Town is long and varied and I’m sure the questions included in this book will bring back plenty of memories. 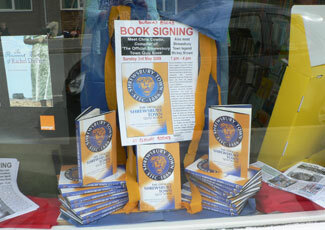 Having been fortunate enough to see a preview of this book, I know that Shrewsbury Town fans of all ages will be entertained for hours with questions about the Shrews past and present. As the club continues to write new chapters in its history, it is always fitting to remember what went before. 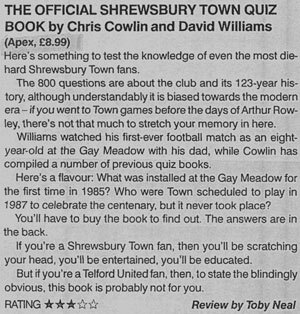 This quiz book should prove to be a big challenge for the most loyal Shrewsbury Town fan. What an excellent book this is, I’m going to get a copy so the lads can test each other’s knowledge on those long away trips on the coach. 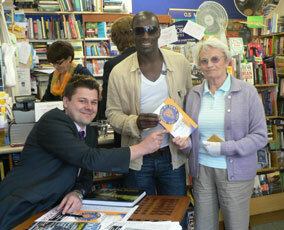 Die-hard Shrewsbury Town football fans are able to test themselves about the club they love with a new quiz book. 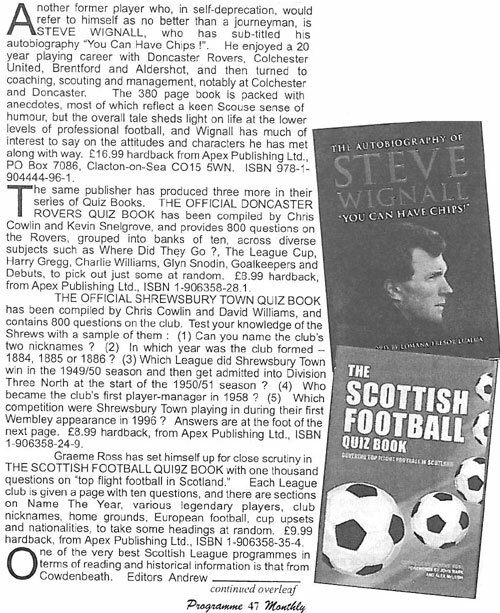 The Official Shrewsbury Town Quiz Book features 800 questions about the club and its 123-year history. Its 112 pages feature sections focusing on everything from players, managers, opponents, transfers, nationalities to wins, draws and losses, covering moments and people which have shaped its history. 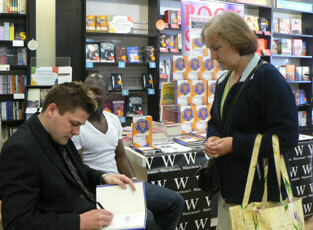 It also focuses on specific seasons and competitions and even includes a section on the current 2008/2009 season. 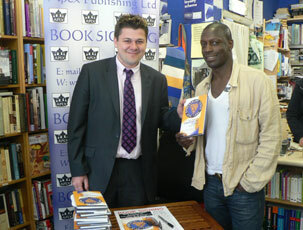 Mickey Brown, Shrewsbury Town’s record appearance holder, who had three spells with the club, wrote the foreword for the book. 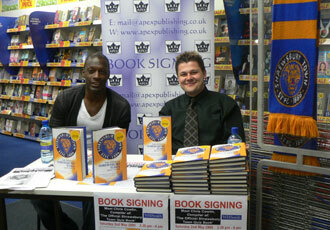 “Having been fortunate enough to see a preview of this book, I know that Shrewsbury Town fans of all ages will be entertained for hours with questions about the Shrews past and present,” he said. The book has been compiled by Chris Cowlin, who has compiled a number of quiz books before and tomes on cricket, the Carry On Films and television. 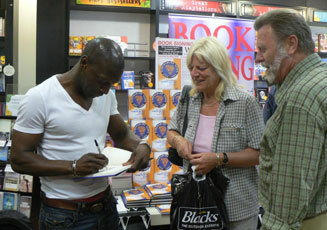 It has also been compiled by David Williams, who has been working in media and public relations in England and Dubai. 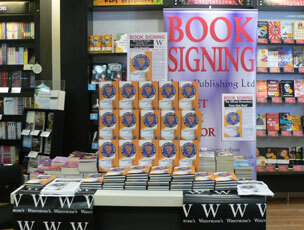 A number of book signings will take place to help launch the hardback book, which is priced at £8.99. These will including a signing by Mr Cowlin at Waterstone’s in Shrewsbury from noon to 2pm on May 2, and at WH Smith in the town from 2.30pm to 4pm on the same day. On May 3 Mr Cowlin will be signing at Pengwern Books in Shrewsbury from 10.30am to noon, and at Burway Books in Church Stretton from 1pm on the same day. Mickey Brown will attend all four signings. A book packed with more facts and figures than you could possibly imagine. With so many different sections, even the most died in the wool Shrews fan is bound to find something that will tax their brain. 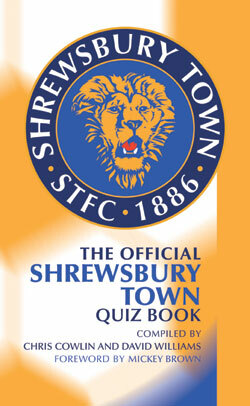 THE OFFICIAL SHREWSBURY TOWN QUIZ BOOK - AVAILABLE NOW IN THE CLUB SHOP! A real test for any true Shrewsbury Town fan! If you love where you live and are passionate about your county, this is a must to test and expand you knowledge about Shrewsbury Town. A must for all Town fans and guaranteed to keep you entertained for endless hours on the long journeys to away matches. 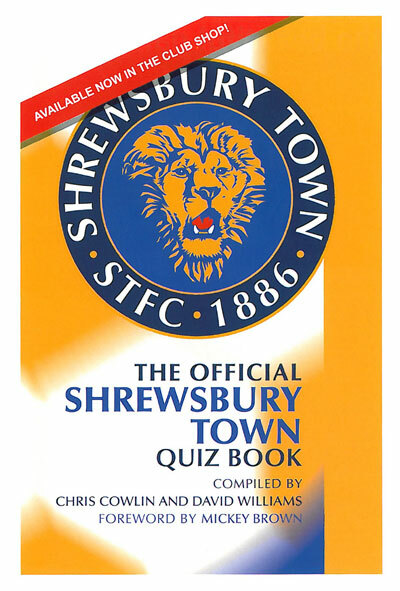 Packed with hundreds of questions catered to suit Shrewsbury supporters of all ages, this book will really test your knowledge of your favourite club. 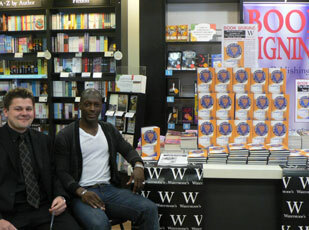 Packed with questions to keep even the most on the ball Shrewsbury Town fans guessing. Long boring coach journeys to away games are no more with this must have quiz book. Testing fans' knowledge and turning up some surprises too. For fun or for reference, a MUST for all Town fans. Everything you wanted to know about The Shrews in one place. Fantastic! If you're a Town fan, you'll either know the answers to the questions, or want to know. 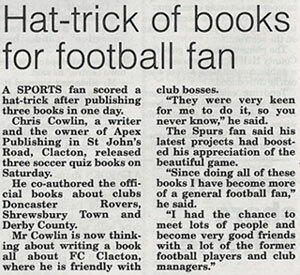 It's a Shrewsbury Town encyclopaedia. 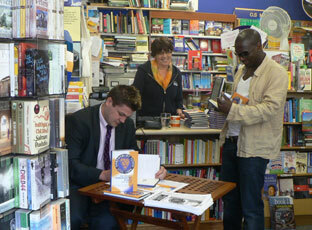 Chris Cowlin signed copies of his book 'The Official Shrewsbury Town Quiz Book' at WH Smith, Shrewsbury. 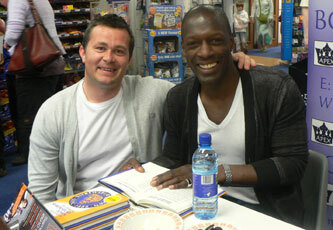 Chris was joined by former Shrewsbury player and record appearance holder Mickey Brown. 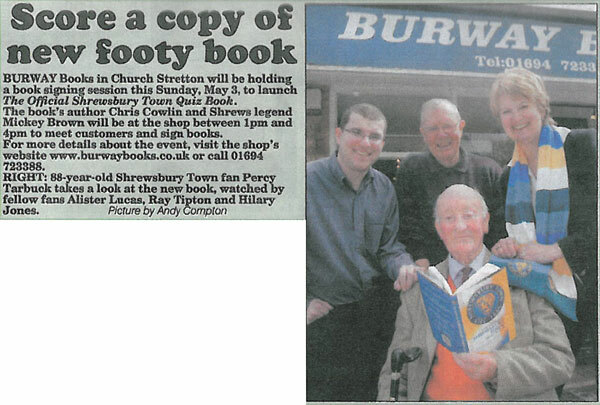 Chris Cowlin signed copies of his book 'The Official Shrewsbury Town Quiz Book' at WH Smith, Shrewsbury. 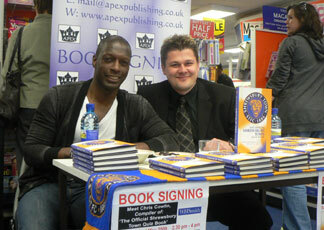 Chris was joined by former Shrewsbury player and record appearance holder Mickey Brown. 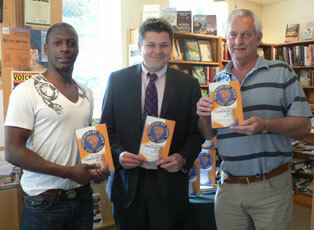 (Picture left: Chris Cowlin with former Shrewsbury Town players Roger Preece and Mickey Brown. 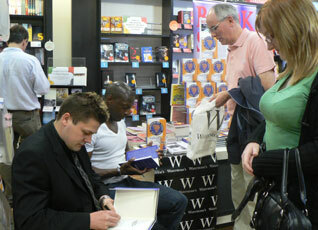 Picture right: Former Shrewsbury Town players Roger Preece and Mickey Brown signing copies of the 'The Official Shrewsbury Town Quiz Book' at WH Smith, Shrewsbury). 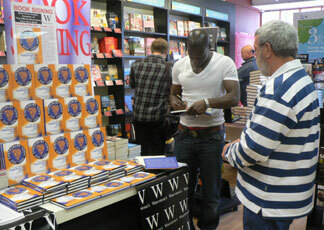 Chris Cowlin signed copies of his book 'The Official Shrewsbury Town Quiz Book' at Waterstone's, Shrewsbury. 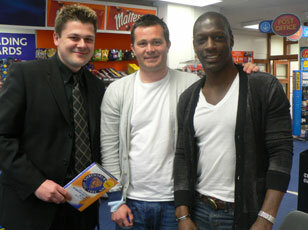 Chris was joined by former Shrewsbury player and record appearance holder Mickey Brown. 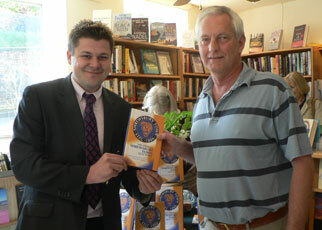 Chris Cowlin signed copies of his book 'The Official Shrewsbury Town Quiz Book' at Pengwern Books, Shrewsbury. 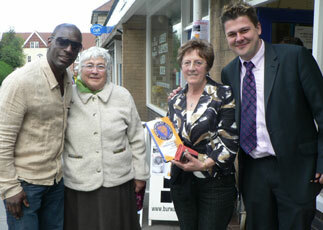 Chris was joined by former Shrewsbury player and record appearance holder Mickey Brown. 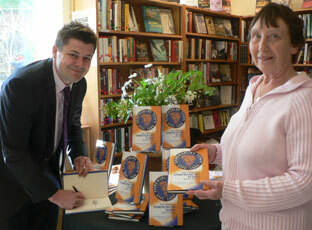 Chris Cowlin signed copies of his book 'The Official Shrewsbury Town Quiz Book' at Burway Books Ltd, Church Stretton. 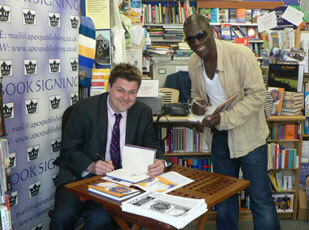 Chris was joined by former Shrewsbury player and record appearance holder Mickey Brown. 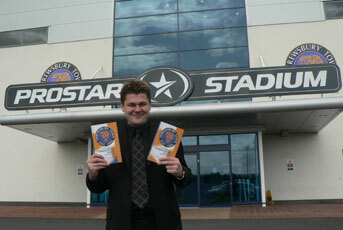 Compiler Chris Cowlin with his book 'The Official Shrewsbury Town Quiz Book' at Shrewsbury Town Football Club, Prostar Stadium.